Sell to Us Price: $1,258.30 each. 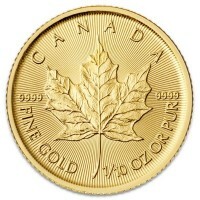 The Royal Canadian Mint introduced the gold Maple Leaf coin in 1979, seven years before the US Mint began minting US Mint coins, like the American Eagle. Today the gold mint coin is sold worldwide to investors who appreciate the iconic Maple Leaf design, the purity and the tradeability it offers. You can build your own personal stash of Canadian Gold Maple Leaf 1 oz coins through Money Metals Exchange. 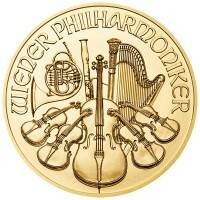 We offer this stunning gold coin in a number of sizes, including 1 gram, 1/20th oz, 1/10 oz, 1/4 oz, 1/2 oz and 1 oz -- our most popular. Regardless of what you are planning to spend, we have a great option. The Canadian Gold Maple Leaf coins stand out because of its purity. 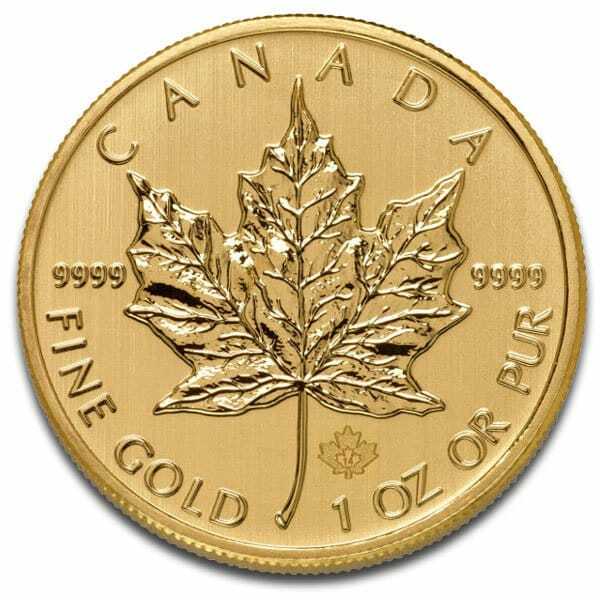 Of the top three most popular gold bullion coins, the Maple Leaf is the only one minted from .9999 fine gold. Both the South African Krugerrand and the American Eagle are 22 karat purity (.9167). This difference in purity is not a large factor when it comes to absolute value because the actual gold weight contained in all three coins is the same. The Eagle and Krugerrand simply have a bit higher gross weight due to the alloy metals used. But some investors do prefer the higher purity and the particular luster that comes with it. When it comes to modern 1 oz bullion coins, only the Krugerrand has a longer history. Walter Ott, who was born in Austria, served as Royal Canadian Mint's Chief Engraver and Director of Art and created the coin's design. He wanted a gold coin that would compete with the Krugerrand with its purity being a symbol of Canadian national pride. Guaranteed by the Government of Canada and traded in world markets since 1979, the Canadian Gold Maple Leaf coin is one of the most popular and easy to trade gold bullion coins in the world today. Each of the coin sizes we offer (1 oz, 1/2 oz, 1/4 oz, 1/10 oz, 1/20 oz, and 1 gram) is beautifully struck. Quality is a hallmark of the Royal Canadian Mint. For the first five years of production, the 1 oz Canadian Gold Maple Leaf was produced with a purity of .999 fine. Purity was upgraded to .9999 starting in 1984. The "three nines" pure coins are bought and sold today at a slight discount to "four nines" coins. The higher purity is preferred in the market. There are relatively few of the older coins trading on a day to day basis. When they become available, they often sell quickly to bargain hunters who are always happy to buy a well-known sovereign coin at a discount. Mint officials introduced an innovative security feature to the coin in 2013. Each Maple Leaf is laser micro-engraved with radial lines and a miniature maple leaf mint mark which contains the coin's year of issue when viewed under magnification. The Royal Canadian mint began operations in 1908 located in Ottawa. Officials wanted to produce coinage independent of Brittain's Royal Mint and to promote metals produced by Canadian miners. Today RCM operates a second facility in Winnipeg as well. 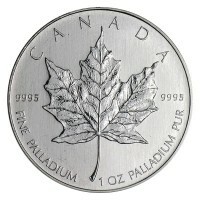 This facility began minting coins in 1980, just one year after the Maple Leaf was introduced. 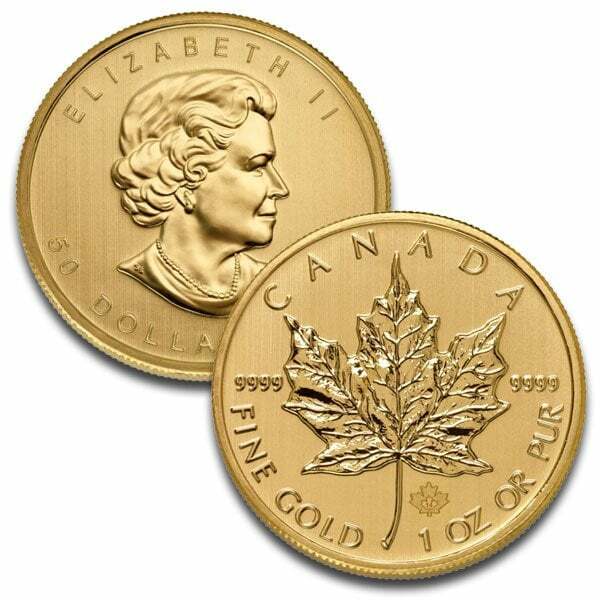 The classic design of the pure gold Maple Leaf coin is virtually unchanged since its introduction. The decision of buy gold has never been easier with the design of these Canadian Gold Maple Leaf coins. 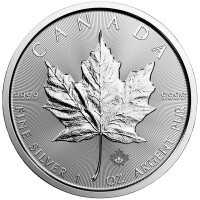 But for those who aren't ready to start investing in gold, you have silver bullion options as well of this beautifully designed coin from the Royal Canadian Mint. Our current buy pricing is $1,258.30 each and we will buy up to 40 ounces at this price. Simply call us on any weekday to lock pricing at 1-800-800-1865. Recently bought this as an investment project. Good pricing, great customer attention and support, beyond BEAUTIFUL coins, good delivery speed, excellent purchase. I will surely buy as often as possible an MMX! I just made my first purchase with Money Metals. Everything was very straight-forward. I did experience a small glitch, which was addressed immediately by the staff; very courteous and understanding. My order shipped on the same day and I received it 3 days later. My recent transaction was easy and I felt secure all the way through the transaction. This was important because it was my first experience with the company. I received my gold coins fast, which tells me they had the stock on hand and didn't have to go out and purchase them to fill the order. It was a five star experience. Great communications, fast delivery, and beautiful product, what more could you want?! The service from Money Metals has always been first rate and I have recommended them to friends thinking about buying silver and gold. 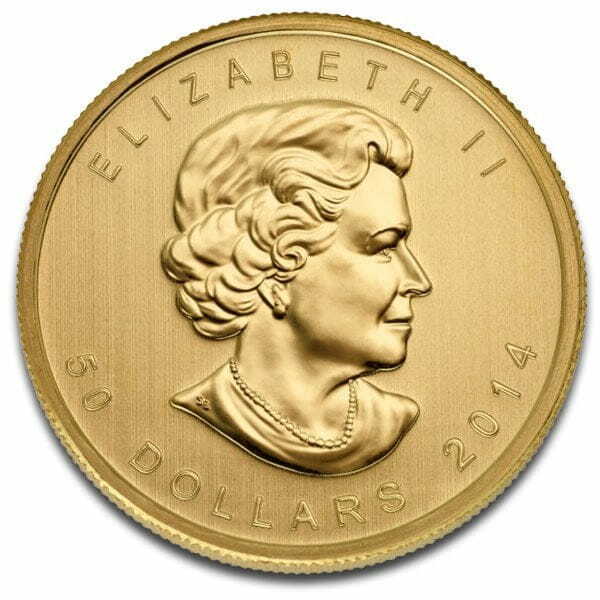 You can now sell your 1 Oz Canadian Maple Leaf Gold Coin back to us online, at a price of $1,258.30 each!